“This is a very exciting opportunity. There is a great clinical need out there that RxFunction is uniquely positioned to address,” said Robert P. Rinek, board member of RxFunction. Minneapolis, MN, September 19, 2017 --(PR.com)-- RxFunction, Inc. is the manufacturer of Walkasins®, the first Wearable Sensory Prosthesis (WSP™) to help improve balance in patients who experience gait and balance problems due to peripheral neuropathy. Rinek brings 35 years of experience in the investment banking and private equity industry to RxFunction’s board. He is currently a managing director in the Piper Jaffray merchant banking group, co-CEO of PJC Capital Partners LLC and a member of the general partner. In the late 1980s, Rinek established Piper Jaffray’s financial institutions group within investment banking, and served as the group’s global head until December 2007. He was with the Northern Trust Company and ITT Financial Corporation before joining Piper Jaffray in 1982. Rinek is also a former board member of Piper Jaffray Ventures. He is a founding member of Twin Cities Angels, an angel investment group in Minneapolis/St. Paul, and he has served on the board of Marshall Financial Ventures, an equity fund that invests in late-stage financial services companies. 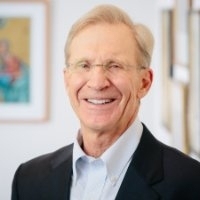 Currently, Rinek is either on the board of, or has board observation responsibility for the following portfolio companies: Living Proof, PerfectServe, Harvest Power, LogRhythm and Brainyak, Inc.
Rinek is a graduate of Denison University and the University of Chicago Booth School of Business where he earned his Master of Business Administration degree. He also holds the Certified Management Accountant (CMA®) professional designation, and has served on the boards of numerous for-profit and non-profit organizations. An estimated 20 million Americans have some form of peripheral neuropathy, according to the Foundation for Peripheral Neuropathy, commonly as a consequence of diabetes or chemotherapy. These patients may lose sensation in their feet, which affects balance and increases fall risk. Walkasins detect when the wearer begins to lose balance and send a signal to a cuff worn around the calf. The cuff vibrates to help the wearer know which way they are leaning, allowing them to correct their balance. Development of Walkasins has been supported by a Small Business Innovation Research (SBIR) grant from the NIH (AG040865). RxFunction is a wearable technology company with an initial focus on developing and leading a new business segment within the U.S. medical grade assistive technology marketplace. The company’s vision is to improve physical ability for social participation and quality of life. Privately held and headquartered in Minneapolis, MN, RxFunction has taken assignment of patented technology developed by co-founder Dr. Lars Oddsson as a research professor at Boston University’s Neuromuscular Research Center, and funded privately and supported under grant No. AG040685 awarded by NIH’s National Institute on Aging. Walkasins have not been submitted to the FDA for review, and are not available for sale at this time.